It’s true that it’s generally easier to just buy a package of pre-made bias tape, but we don’t sew our own clothes because it’s easy, do we? I like to make my own bias tape most of the time because I can get a perfect color match and I can match the weight, hand, and fiber content of the main fabric. Pre-packaged bias tape is generally a cotton-poly blend and is pretty stiff. That might be just fine if you’re putting a Hong Kong finish on the seams of a denim jacket, but if you have a cotton voile or a silk crepe de chine blouse, it’s going to add a stiffness that you won’t want. What fabric do I use for bias tape? Stylistically, it’s up to you whether you want your bias tape to match your main fabric or contrast. As a general rule, I like to use lightweight cottons like voile or lawn since it makes a lightweight bias tape that is easy to make and press but won’t change the hand of lighter fabrics. If your main fabric isn’t too lightweight or drapey then a quilting weight cotton broadcloth is a nice choice and very easy to work with. You can also make your bias tape from much drapier fabrics like silk crepe de chine or charmeuse or rayon viscose. It can make a beautiful effect but it’s much harder to press accurately as it slips around. How do I make bias tape? To make your own bias tape, use the straight edges to determine the 45 degree true bias of the fabric and cut along the true bias. You can do this by using a large quilting ruler with a diagonal marked on it. Lay the diagonal so it is along your straight grain (the selvedge) and the edges of the ruler will be on the bias. I chalk along the bias line and then cut along my chalk. Alternatively, you can fold the fabric so that the two straight edges are together and cut along the diagonal fold. After making your first cut, measure, mark, and cut along an even distance from the edge of the first cut. How do I join bias tape? If your single piece of bias tape isn’t long enough it’s easy to join a second strip to lengthen the bias tape. Overlap the bias strips at a 90 degree angle so they make an L. Draw a line along the diagonal of the square that they overlap makes and sew along that line. Once you have made your strips of bias fabric you may want to press them into pre-made bias tape (Note: This isn’t always the case. For example, the Ultraviolet Tee has instructions for finishing the neck with bias fabric without first folding it into a tape.) You can buy bias tape makers that are quick and easy to use. You thread the fabric into the tape maker and it helps to tuck it into the right fold for you as you press it on the other end. Sometimes the simplest methods are best and I get the best results making bias tape with a cardboard template. All you have to do is cut a piece of cardboard the width of your finished tape and use it to press the edges over. My first time with self-made bias tape came when I was making a silk slip for a client to wear under a sheer kameez (Punjabi dress/blouse). I had initially used purchased bias tape for the neck and armhole edges, but it didn’t have enough mechanical stretch and caused the neckline not to lie flat. Also, the armhole edges were scratchy. Out came the stitch picker and the yardstick (a classic schoolhouse width is perfect for the use), and voila! 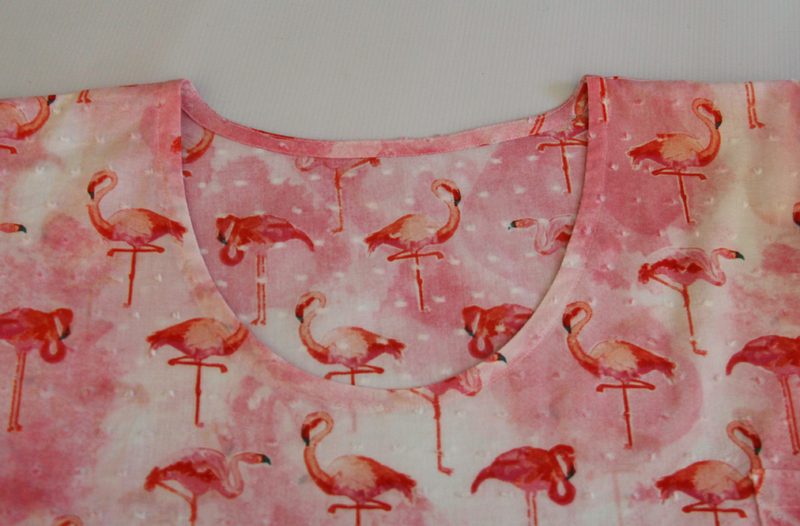 perfect bias binding that matched the drape of the garment and was soft and easy on the underarms. What a great tip to use a yardstick! Thanks for sharing. Hi Erin, thanks so much for your article. I need to make single fold bias tape of 32mm (1 1/4in). I am very much confused as to how proceed, what measurement should I start from? If you need your finished measurement of the single fold bias tape to be 1 1/4 in, then add on 1/4″ to each side (which means adding on 1/2″ total for a cut width of 1 3/4 in). Then fold each side to the wrong side 1/4″.